Editor’s Intro: Clear aligners vs. ceramic brackets: Which esthetic option should patients choose? In recognizing where we are with esthetic orthodontic treatment, I typically discuss three approaches with patients. First, esthetic appliances can refer to ceramic brackets, which are much less visible than traditional metal brackets. Second, esthetics can refer to treating cases with clear aligners and eliminating the need for brackets. The third choice is a combination of the first two options. If a patient walks in my door asking for a specific appliance, we focus on the patient’s main concern about his/her smile and treatment goals. We show patients a model with metal braces and a model with clear braces — 90% of the time they pick the ceramic braces or aligners. Occasionally, children will select metal because their friends have them, and they want the same thing. Almost every adult, without exception, opts for ceramic braces or aligners. With clear aligners, we must appreciate that there has been a tremendous amount of advertising directed at consumers. This brings people into the office asking for aligner treatment because they saw a commercial advertisement, or they’ve seen a friend who has them. As our knowledge and capability in managing aligners progresses, we are finding that there are quite a few clinical problems that can be managed just as well with aligners as they could with braces. However, there are certain cases that do not treat as well with aligners as they do with fixed brackets — we have more control with fixed braces. In this instance, what we find with some patients is that they are disappointed because they had their heart set on aligners — until we educate them! We show them their smile photographs and are able to point out that the lower teeth are often not visible when they smile. We can use aligners on the upper teeth and brackets on the lower teeth where more work is frequently needed anyway. This maximizes the treatment options while also maximizing the esthetic possibilities! How did the concept of esthetic orthodontics come about anyway? There was a shift in public perception aided by several factors, including the improvement of ceramic brackets over the years. In reality, we’ve had clear brackets for many, many years, but older brackets were made of plastic, were not as durable, and would stain a lot. Once manufacturers switched to high-quality ceramic materials, all that changed. 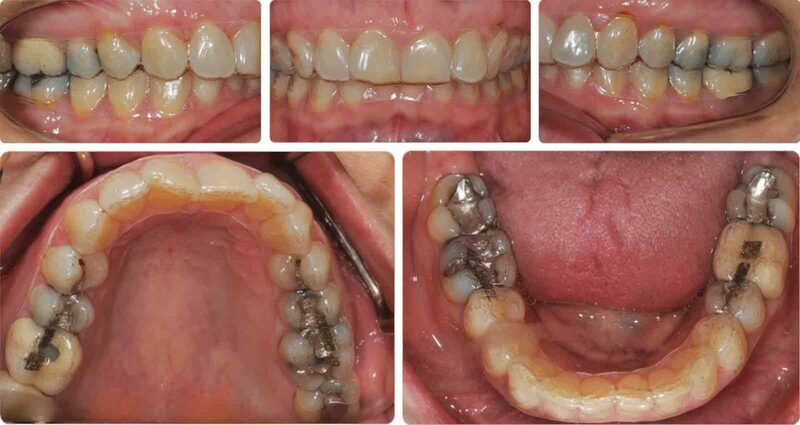 The brackets did not stain, and they remained esthetic throughout treatment. Concurrent with these material improvements, you had the entertainment industry using orthodontics in a certain negative light. For the longest time, you would make someone look nerdy by putting braces on them. Some people remember the tele-vision show “Ugly Betty.” Unfortunately, the main character had big, obnoxious metal braces. Social media has also changed the landscape. In the past, kids had braces and maybe a few friends and relatives knew; however, with Facebook and Instagram, now EVERYONE knows. Treatment would be evident, and everyone would know about it. This expanded awareness was pushing patients toward demanding more options from their orthodontists. So the combination of the sociocultural shifts and the advanced ceramic technology worked toward the transition to esthetic braces. Another factor that comes into play with patients includes lifestyle preferences. I’ve had patients come in who want aligners and not braces. We then talk about what is required of them to be successful with aligner treatment — 20-22 hours of aligner wear, the attachments on the teeth that are needed to effect certain tooth movements (which never seems to be shown in the clear aligner commercials), changing the aligners, and cleaning them. Once this is explained, the patient can then make an informed decision. It’s wonderful to have options to meet the needs of all kinds of patients! In another example, I have a patient who is a pilot, meaning that he travels a lot and lives a relatively nomadic life. He didn’t want to carry many pouches of aligners around with him and worry about where he might leave them. So, we went with ceramic brackets. At the end of the day, both of these patients got what they wanted, which was an esthetic treatment option. Second, we look at the clinical situation in terms of the bite discrepancy and dental alignment. We educate the patients about their options. Third, you must take into consideration the patient’s compliance. There is a big difference between a 13-year-old boy who may be there just because his parents want him to get his teeth straightened, and adult patients who are very motivated because they made the decision for themselves and are also paying for the treatment. You have to take all those things into account — the patient expectations, the clinical situation, and the patient compliance scenario. Lastly, there is another “win” that orthodontists need to identify in their approach to working with manufacturers. Ultimately, I want control over what I order, and how I order it. Frankly, the fewer vendors involved in the treatment, the better. In this way, I can appreciate that the left hand can talk to the right hand — or the upper aligner can speak to the lower brackets. In the past, if I wanted to do a hybrid case, the main aligner company would charge me for the entire case. With recent changes in the industry, more companies are providing aligners, so there is more competition, which is good for orthodontists and patients. Of course, if I really want fewer vendors in the process, I want a manufacturer that offers both brackets and aligners, as well as the service and support that comes with that relationship. Orthodontists should look for a single vendor that provides aligners and esthetic brackets. My practice has approached the demand for esthetics by being prepared with a spectrum of options that we can customize to fit the patient’s wants. Being flexible and in control of our esthetic treatment options is good for my practice, good for my patients, and good for me! Are ceramic brackets an esthetic option in your practice? Check out this product profile with information provided by 3M. Anoop Sondhi, DDS, MS, received his Doctor of Dental Surgery degree from the Indiana University School of Dentistry and his postgraduate certificate and Master’s Degree in Orthodontics and Dentofacial Orthopedics from the University of Illinois. He taught as a professor in the Department of Orthodontics at Indiana University and continues as a visiting professor at several postdoctoral orthodontic programs around the country. He teaches advanced courses on treatment techniques at national and international orthodontic conferences. He has authored chapters in several orthodontic textbooks and journals. Dr. Sondhi and his wife, Rani, have four children — Jason, Sara, Jennifer, Melissa — and five grandchildren. Disclosure: Dr. Anoop Sondhi is a consultant and/or speaker for 3M Orthodontics.